Meet Azriel. Nothing in the world makes this emo creature smile. Except a mouthful of Cheetos. Help a hipster out – feed Azriel now! Eat as many Cheetos as possible on each level! 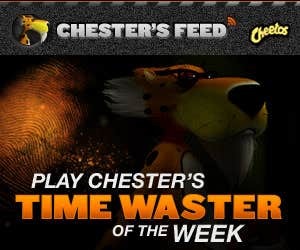 The further away and faster a Cheeto is moving, the more points it’s worth. Flavor Frenzy mode gives you double points. You need to eat a certain amount of Cheetos on each level. This goal is marked at the bottom and will increase over the levels.